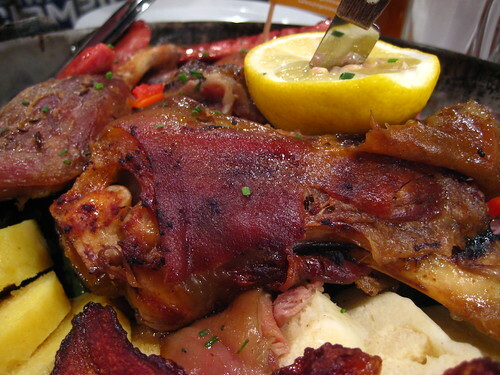 The Czechs are known for their beer, not for their food. It's not bad, I grew up eating it, but it's not exactly healthy. It's fatty, heavy, and relies on the dumpling or knedlicky. Oh, and a lot of cabbage too, unfortunately one of the only vegetables I don't like. I'll take the hops-based option instead. Yet, Prague had at least one surprise for me, a completely American surprise. We ate a lot of knedlickys-is it knedlickys, or maybe knedlickies? I don't know, I didn't go to Czech school. Anyway, I can't eat another one until at least the holidays. I good amount of the ones we had were dry and badly needed gravy or sauce, anything to soak it in. 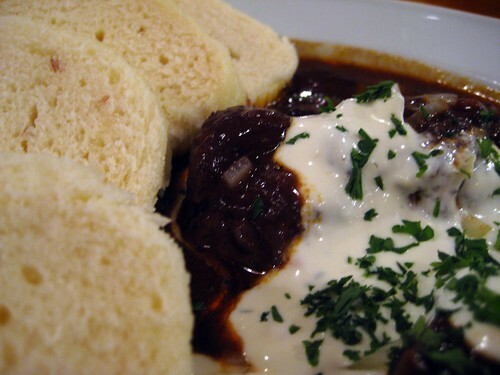 The best knedlicky came with a fantastic beef goulash dish from an awesome spot, so awesome it gets its own post. Other than the ubiquitous dumplings, there was an obscene amount of duck to be had. Good duck too, nice and lean, not fatty. If you didn't want either, and by the end I didn't, there were plenty of other Eastern or Central European dishes to be had. 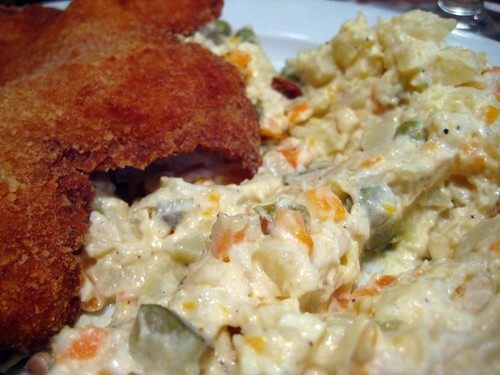 During our second trip to U Medvídků, I chose to try the pork schnitzel with potato salad. 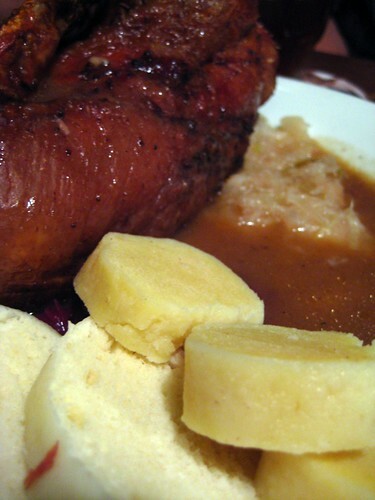 The schnitzel was good, but the potato salad was what stuck out. Usually, I'm not a fan of mayo-based salads, but this was no regular American potato salad; it was Russian. This involves peas and carrots, mayo and mustard. Who knew this could be so delicious? I didn't, and it was. 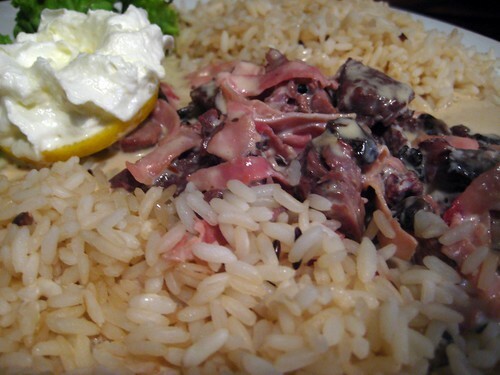 On the other hand, Mommsie went for the Beef Stroganoff with wild rice. Another good dish, she thoroughly enjoyed it, and then started eating my potato salad. I guess all the drinking makes her hungry. The greatest surprise came from All-American McDonald's. 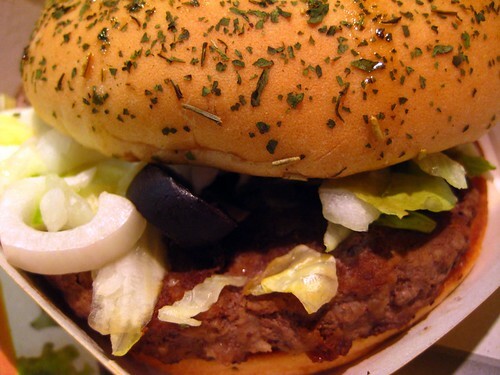 Apparently, they're pushing a Greek menu complete with Brownie's favorite type of burger, the lamb. This lamb burger is called "Olympos", I speak no lies, I had to order the Olympos with a straight face. Ciabatta bread, feta cheese, black olives, and a yogurt sauce. Not awesome or near delicious. 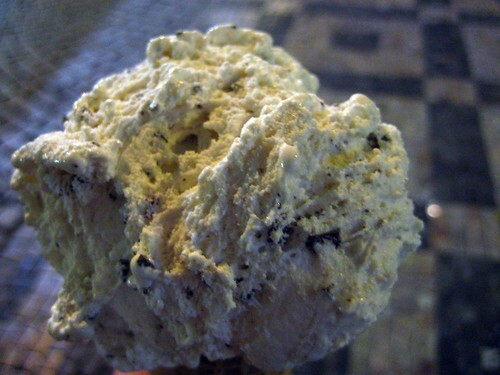 Dessert-wise, the Czechs and their tourists love ice cream, gelato to be exact. It's everywhere. 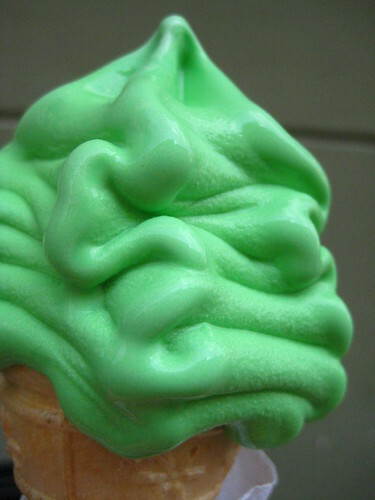 I only got a few cones there, and all but this one disappeared before I remembered to take a picture. 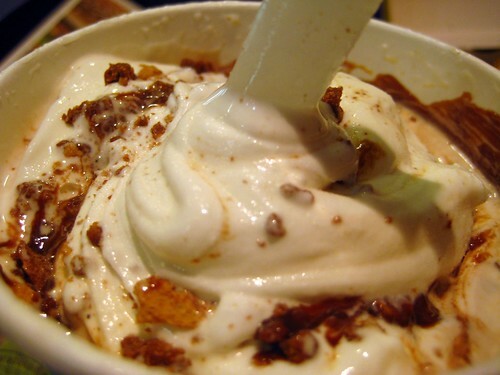 Another McDonald's surprise came from the McFlurry camp. Flavored ice cream-chocolate, strawberry, or caramel-with strange candy add-ins, like Kit Kat. Why can't we get more options like this here? Lastly, the Czechs are also dabbling in alcoholic ice cream. On our way to visit Prague Castle, we passed the Absinthe shop. Of course, they specialized in absinthe, they did the whole nine done to a lit sugar cube while I waited patiently for my absinthe ice cream. If it was made with real absinthe, a claim I doubt, it was most definitely the Bohemian kind since there was almost no licorice taste. i was in russia a few years ago and had the "greek mac"--two hamburger pattys in a pita pocket w/some kind of greek toppings. not yummy. and oddly, the only time i ever go to mcdonalds is when i'm in another country!